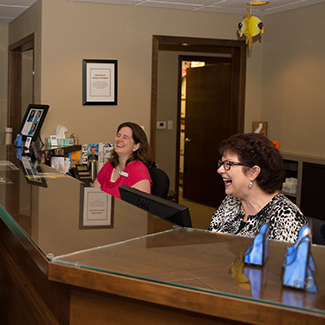 Since 1994, we’ve made family wellness the focus of our chiropractic care center. Chiro-Health Chiropractic Care Center is passionate about working with Plymouth community members of every age and stage, from newborns, babies and kids, to mom-to-be, dads and grandparents. Dr. Cindy and Dr. Londa work as a team to ensure you receive the best care. Our experience enables us to meet your challenges head on, while treating the whole person. We want to empower you to live a life without limits. We are dedicated to making a difference. We provide exceptional pediatric chiropractic and prenatal chiropractic for those seeking developmental excellence for their children. We’re kid-friendly, family-focused and mom-approved. We welcome moms, dads, grandmas and grandpas, little kiddos, teens and young adults. Whatever your age, we have a special place for you in our practice. We want to be a bright spot in everyone’s day, whether it’s through a warm smile, a kind word or a hug. When you walk through our door, we want you to know you’re in the right place, a place where everyone knows your name. You can exhale and take a few moments for yourself. We listen. Then we make a plan with you-a plan for health and wellness. We help you discover the tools you already possess and inspire you with a few new ones. Our goal is to send each person out into the world a better version of themselves. We take care of you so you can take care of life. Health is a matter of choice, not chance. Excellent health has its roots in childhood and must be protected through each developmental stage of a child’s growth. We live that philosophy every day through the specific treatment protocols found in our unique pediatric and pregnancy chiropractic programs. We love building relationships with your children and helping them to lay the foundation of healthy habits so they can sail smoothly into adulthood. A few small but significant changes can reshape a family tree, giving future generations the strength they need to stand tall. We believe that it’s much easier to grow a healthy child than to fix a broken adult. We can start growing those roots today! We’re known as the go-to practice for quality chiropractic wellness care. Our office is a place where everybody knows your name. Some of our staff have been with us for decades. We pride ourselves on the strong relationships we’ve lovingly built with our practice members. Dr. Cindy and Dr. Londa take a unique team approach with every person who is under our care. Our practice members benefit from this by having the insight and experience of two doctors in helping them to optimize their health. We have a reputation for excellence in the field of pediatric chiropractic and are a destination spot for many parents seeking help for their children. People feel genuinely cared for in our office. Whether you’re just getting started with chiropractic care after years of poor health or have been under wellness care for decades, we welcome the opportunity to partner with you in achieving your health goals. We are in the business of changing lives. Contact our chiropractic office today!